The Sun Metro ridership numbers for the 2018 fiscal year are out. 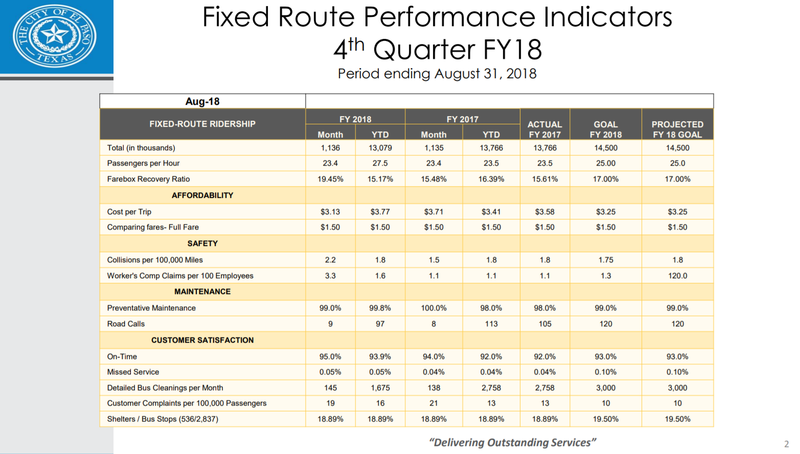 They show a 5% decrease in riders from 2017. The year before (2017 vs 2016) showed a 9.3% decrease. Before that the period from 2016 to 2015 showed another 9.2% decrease. They reported that the cost per trip went up from $3.41 to $3.77, a ten percent increase. If you take the total amount of money that they were budgeted to spend for 2018 and divide it by the number of rides they reported, the cost per ride was actually $5.45. This entry was posted on Friday, November 23rd, 2018 at 5:12 AM and is filed under City government. You can follow any responses to this entry through the RSS 2.0 feed. You can leave a response, or trackback from your own site. Where will the trolley revenue and expenses be reported? Are they part of Sun Metro? I saw video of passengers seated in the streetcars and (not just fat people) but even regular size people hang off into the isles. If people were STANDING in the isles, their butts would REALLY be in your face. 2 regular size people nowadays cannot pass in the isle on the El Paso streetcars.